Computers are a significant part of our lives, no matter our age. We often don’t even think too much about the simple tasks we perform on our computers every day. But for many elderly people, this isn’t the case. Because of deteriorating eye-sight and hands that have started to shake, using a typical computer keyboard can present a big challenge. Most keyboards are made in a standard size and shape, and are suitable for the majority of users. However, they are not very practical for seniors and the elderly because the letters are often too small to see. Other seniors feel that keys are too close together which leads to many typos. We can all agree this is very frustrating, which is why they need a large key computer keyboards for seniors. Luckily, some manufacturers have taken note of this. They wanted to make products that would improve accessibility and save seniors’ time when using a computer. There are now special keyboards available which offer greater letter visibility, key size and even some other useful features. 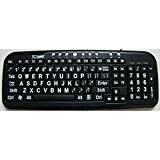 I am going to review and discuss the best keyboards for seniors, as well as what to look for when shopping for a keyboard for yourself or a loved one that is encountering these problems. You can restore the comfort and functionality you once had and enjoy the time spent behind a computer. In a hurry? Here are my recommended keyboards for seniors. Each of these will make using a computer easier. Images, Ratings, & Prices from Amazon Product Advertising API - Updated on 2019-04-22 at 18:58 - contains affiliate links (see footer). This is a great product designed for anyone who has difficulties seeing a regular keyboard. The keyboard itself is the same size, but the print is largest possible that fits on a standard keyboard key – 3 times larger than usual. The letters and symbols are black while the keys are bright yellow color. This way the contrast additionally boosts the visibility, and keys are easily seen and recognized even in low light. 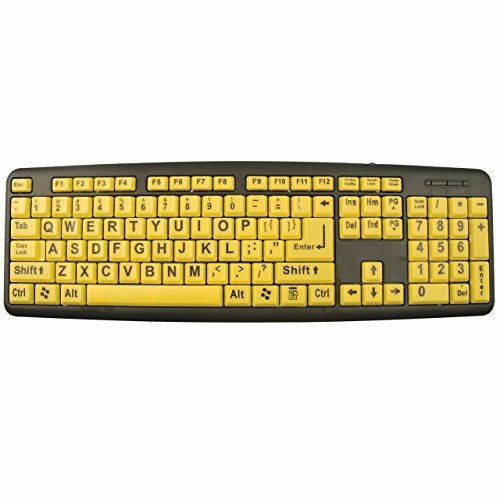 This is a regular sized keyboard which includes all the buttons and functions a standard keyboard offers. It even has additional hotkey buttons on top which are very useful and can be programmed as shortcuts for music, your favorite internet browser, or settings for example. The layout is standard US keyboard layout, so you won’t have to learn to type again. Users who bought this keyboard are very satisfied with their purchase. They say it is very visible, and the functionality is good too. It’s a simple plug and play keyboard which is easy to install and works well with any computer system. This keyboard is pretty similar to the previously reviewed product. It also has large black letters on yellow background for increased contrast and visibility. What makes it different is that this one is a little lighter in terms of buttons available, since it doesn’t include the additional hotkey buttons on the top. This may seem like a downside, but that also means that this keyboard is simpler to use and less expensive. It easily connects and installs on your computer and it’s both PC and Mac compatible. Another difference compared to the previous one is that this one is spill resistant. This may be a very useful feature for everyone, especially elderly with shaky hands. If by any chance something got spilled you can simply dry it off, instead of rushing to buy a new one. People who used this keyboard say that typing is really easy and there is no strain on your eyes. This is especially good for nearsighted people, making typing much easier for them. 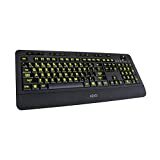 It has proved to be very durable with good key response, the lettering didn’t wear off fast and it’s possibly the best large print keyboard for elderly. 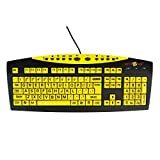 If you don’t like bright yellow keys, this is a product for you. This is a black keyboard with white letters. But, of course, the letters are extra large, largest possible that will fit on a key. Even though the contrast is different than on previous products, it is very visible even in low light conditions. Overall this is a great product for anyone who suffers from sight impairment. 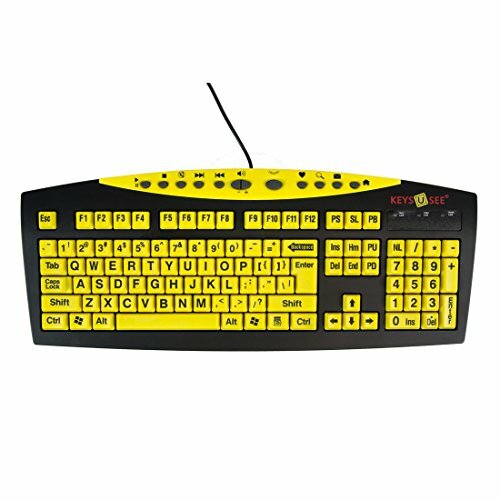 This keyboard also offers hot key buttons on the top – seven for multimedia and additional buttons for home and e-mail. However, these buttons can’t be reprogrammed. It connects to your PC either through USB or a PS2 connection. It doesn’t require special installing, it works instantly. 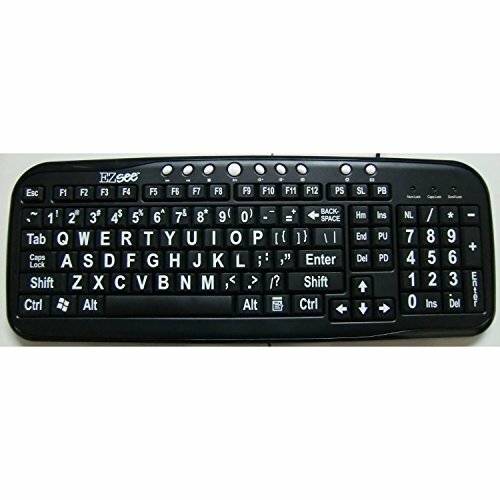 This keyboard is a popular choice for people who want to improve their experience typing. People say it’s great for users who have slightly impaired vision, but may not be a good choice for people who have very weak sight. The quality of the keyboard is very good, and the print on the keys doesn’t wear off quickly. It’s a huge improvement over standard keyboards. This great keyboard is different from all previously reviewed. It doesn’t just offer large lettering, the keys themselves are larger. Each key is 1 square inch in size which is fantastic. Of course, the lettering is the maximum possible size too making this probably the best keyboard for low vision. No more worries about missing a key or pressing several keys at the same time. The keys are white and the lettering black which creates a really nice contrast. The layout of the letters is standard US layout. However, because the keys are larger, this one will need some getting used to if you have previously used a standard keyboard for a long time. Overall keyboard is same in size as standard ones, but they removed the numpad on the right to make space. Function buttons are present but smaller, round and placed at the top. It works well with all devices, including PCs and Macs. A fantastic addition to this keyboard are 2 USB ports which are built-in. This product has many satisfied customers. People say it is great for every person that has problem with sight or hands. It’s really easy to use and really like it. You see everything clearly, and hit your desired key even if you have large fingers or your hands shake. A keyboard that offers similar features but with one major difference. This one offers backlight in 5 different colors. You can choose the one that is best for your eyes. There is even an option to adjust the brightness of the backlight by turning the brightness wheel. Colors available are red, pink, blue, cyan and chartreuse. If you don’t like the colors. the backlight can also be turned off. It is also a plug and play keyboard which easily connects to every device. The letters on this keyboard are very large, and most anyone with impaired vision is going to appreciate them. The keys themselves are regular size and black and the backlight illuminates through the letters. The light up feature can be set to be very strong giving you very good visibility even in complete darkness. It includes hotkeys for internet, multimedia, and calculator. Users have very nice things to say about this keyboard. The illumination is very good, so everyone including seniors can see letters clearly. It’s very nice that the keyboard gets its power through USB port, so you don’t need to change the batteries. It’s perfect for everyone with weak sight, especially in low light conditions. I wanted to add this product to the review, even though it’s not a keyboard . 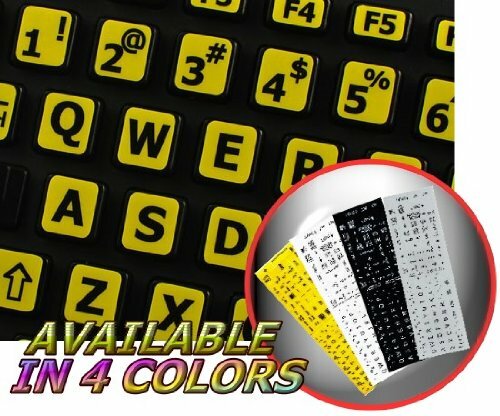 If you don’t want to spend money buying a new keyboard but still need to solve the problem of not seeing the keys properly, this could be the solution for you. These are high-quality stickers made from non-transparent matt vinyl. They have a yellow background with large font black letters printed on them. And they can be applied to any keyboard – desktop, laptop or notebook. Stickers are individually cut and you get one for every key of a standard keyboard. Once you take your time to apply them properly, you can be sure they will stay there. They don’t fall off, even after years of use. Many people tried these stickers over their regular keyboards and say it greatly improved the visibility. The quality is impressive. This product is recommended by therapists for anyone who strains their eyes while looking at the keyboard. 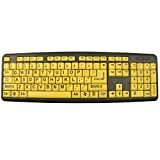 Depending on your personal needs and preferences, you should take a few things into consideration when shopping for a new keyboard. If you have visual impairment, looking at keys on a standard keyboard can put a real strain on your eyes. Not only does it take more time to get things done when you’re searching for every single key across the keyboard, it can also give you a headache. Letters on regular keyboards are relatively small, and placed in the upper left corner. A much better solution is a keyboard that uses a bigger font for the letters, so they cover the entire key. Besides size, contrast can also be very helpful for people with weaker sight. Black letters on a yellow background are much easier to spot, so that is a great addition. However, for some people a larger font isn’t enough. People with arthritis often have problems hitting the desired key because their hands shake or their joints aren’t flexible enough to type in small spaces. For them, regular key size is just too small. As featured above, there are large key computer keyboards for seniors that offer significantly bigger keys, even a square inch in size. But don’t worry, these keyboards won’t take up all the space on your table, they are roughly the same size as regular ones. Keys on these keyboards are strategically placed, and some keys are removed, like the numpad that is usually on the right side of your keyboard. 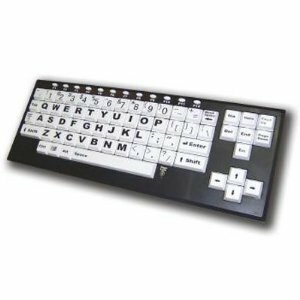 This type is probably the best keyboard for elderly, however if they are used to a regular type it will take some time getting used to. In addition to this, it is useful if a keyboard has shortcut keys that can be programmed for certain actions. Additional USB ports on the keyboard can come in very handy, so elderly can plug other things quickly. Also, if a keyboard has anti-spill design it’s a big plus. All of us sometimes spill our drink on the keyboard, so it’s nice to be protected. Why are Some Keyboards Difficult for Seniors? Not everyone can touch type, and even if you can you probably don’t know the exact location of every letter and symbol. This is why it’s important to see the keys. Elderly struggle with this because their eye-sight is not sharp, so the letters and symbols become blurry and hard to recognize. Because of this, a simple task like writing an e-mail consumes a great deal of time. Also, many seniors have deteriorating motor skills. Their eye-sight may be just fine, but their hands shake because of arthritis or other illnesses that impact the hands. Or it’s simply difficult to precisely hit a small key on a regular keyboard. That is why seniors require specially made keyboards with keys that are easier to locate and hit. When you’ve made your mind and picked out the best keyboard for you or the senior in your life, give yourself time to get used to it. Even though it’s designed to make your life easier, it may be different from the one you previously used so take some time to learn the positions and features so you can get the most out of it. This is especially important if you bought a keyboard for a loved one who is old and isn’t familiar with computers. New skills can be acquired, it just requires patience. Besides this, shortcuts can be very useful too. Whether they are physical keys on the keyboard, bookmarks in your browser or programs on your desktop, they eliminate the need to type and search for the same thing every time. Special keyboards for the elderly are a great idea to overcome restrictions seniors encounter every day. With these best keyboards for seniors, you can enjoy yourself again. Check out my recommendations for the best computer mouse for seniors and the elderly too. Go through the options we presented, and choose one that is best suited to solve your problem, they are all very good. I am sure you will be very happy with the results! Tell me about your experiences with computer keyboards in the comments below! Do you have any other advice or tips you’d like to share?